Learn how to manage your chairs as an asset using our organizational approach to chair selection and fit. Earn your Certified Chair Assessment Specialist (CASp) credential! When you have the letters CASp behind your name, you’re showing you're employer or your clients you are serious about helping others with their ergonomic chairs. Not only do you get the title, you get the Certified Badge, to use in your personal resume and curriculum vitae. With the CASp you’ll not only gain the knowledge needed to advance your career, but you’ll also prove your competency in assessing chairs and prescribing the right chair for any person who needs one. Ready to get started? Sign up for our Chair Assessment Specialist Masterclass. Once you complete the requirements, you are all set! 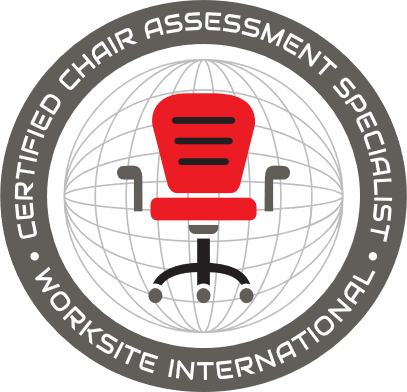 The Worksite International Certified Chair Assessment Specialist (CASp) credential demonstrates your mastery of the methodology developed by Alison Heller-Ono for chair assessment and fitting. When you have the letters CASp behind your name, you are showing your employer or your clients you are serious about ergonomic chairs! Use the title and the badge on your reports, your business cards and/or in your business marketing. No other course in the ergonomics marketplace will deliver this high-value training specifically on ergonomic chairs. Understanding the science of sitting and the art of chair selection is the cornerstone of an office ergonomic evaluation. Set yourself apart from your peers. You'll get all the resources and assets featured in both classes. You'll have access to all the instructional videos and course content for a full year to revisit and continue your training beyond your initial exposure. Good skills are developed when you continue to work on what you learned beyond your initial exposure. The Chair Assessment Specialist Masterclass includes all the tools featured in both our Chair Assessment and Fit classes. That is all the forms, databases, dashboards and more! Alison will be available to you through 4 small group video-coaching sessions (60 minutes each) and 3 one: one video-mentoring sessions (30 minutes) to help you through your first three chair fittings. As well as be available for email and phone support. This high value workshop leading to certification is available for a one time payment or split your payment over 3 months. Should I do the Chair Assessment Training or Chair Fit Training first? We recommend you begin with the Chair Assessment Training and complete all the modules and assignments first. If you need to do a chair fitting, then certainly, begin here. But the Chair Assessment Training is the foundation to the workshop. Why should I manage my chairs as a system? Ergonomic chairs are the most important asset in your workplace aside from your people and your computers. This is what makes people productive in today's workplace. If you aren't managing your chairs as the valuable asset they are, you are losing money. Our chair assessment software tools will help you determine whether to keep, repair or replace your chairs; and if you must replace, how to perform an accurate chair fitting. It's all part of the chair asset management lifecycle. How can I save money using the Chair Assessment System of training and tools? Our training will show you how and where you can save money on managing your chairs more effectively. This is through reducing employee discomfort, minimizing employee injuries and recognizing the liability of poorly designed and failing chairs. Is there a renewal fee to maintain my certification and use the Ergonomic Chair Assessment tools? Yes, you will need to keep your certification active by submitting one chair fitting a year to us along with $197.00 to maintain your certification. This renewal will give you ongoing access to the latest version of our Ergonomic Chair Assessment forms and tools. If you sign up before April 30, 2019, you'll save $50.00 on your enrollment!